The Drake TR-7 Transceiver does have one internal 5 amp fuse. The fuse is a standard AG3 fuse, 5 AMP rating. This is the first place you should check if the radio is totally dead and you know the connected power supply is delivering the proper voltage. To locate the fuse first removing the top cover. 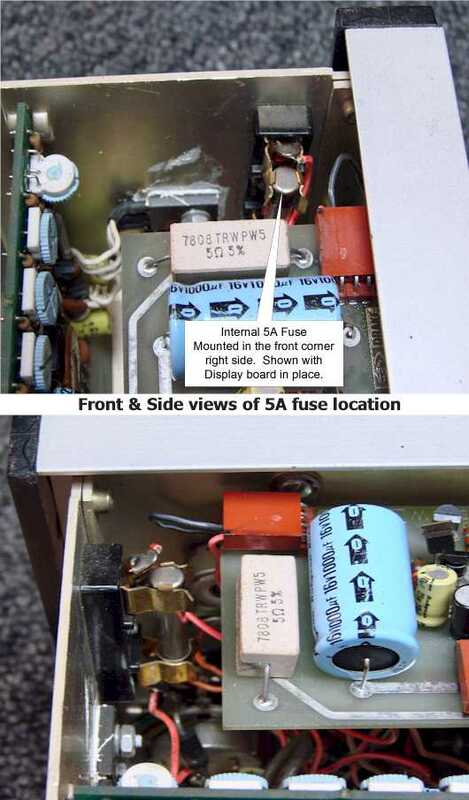 The fuse holder is mounted on the right side panel in the front-right corner of the radio just beyond the edge of the Digital Display Board and directly in front of the Power Supply Board. Before attempting to remove the fuse make sure all power is disconnected from the radio. The fuse is somewhat hard to access but with care and a small flat blade screwdriver the fuse will easily pop out from the holder. Replacing the fuse is a bit more tricky. First center the fuse over the holder clamps then push into place. Access to the fuse is easier if you work from the long side, going in behind the Digital Display Board. Use extreme case when replacing the fuse you do not touch or move the small blue controls on the power supply board, especially the +10VDC regulator adjustment, the first control mounted up-right closest to the outside case edge. Moving these controls could put the transceiver out of alignment and/or voltage regulation. The Drake TR-7 Transceiver has two replaceable dial lamps, one behind the S-Meter and the other behind the VFO analog frequency readout dial. The bulb is a standard #53 bulbs rated at 12VDC, replacing them ranges the two extremes, "Simple and Easy", to "Your Worst Night-mare". The bulb behind the "S-Meter" is the quick and easy choice, the bulb socket clamps to a bracket directly behind the meter. The socket assembly just lifts off the bracket by pulling upwards on the assembly to snap in a new bulb. The picture above shows its mounting directly behind the S-Meter easily accessible once the case top is removed. 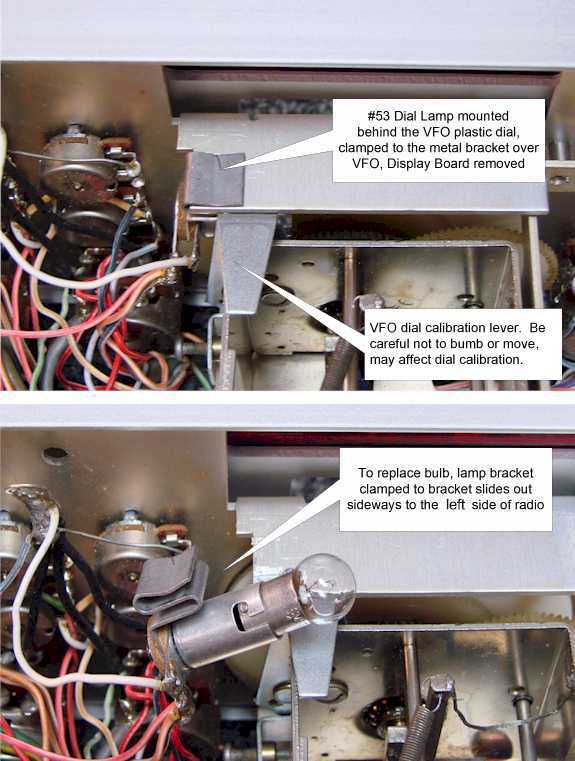 Pictured above in the top picture shows the location of the dial light bulb behind the VFO dials. The second picture shows the bulb socket assembly removed by pulling sideways to the left. Replacing the bulb behind the analog VFO dial by some would be considered a "night-mare" just getting to it. After removing the wrap-around case your first task it to remove the top mounted Digital Display Board, thus, the night-mare. This is probably the most difficult board in the entire radio to remove and reinstall. To remove the display board first remove the wire and cable going to the High-Pass Filter and remove the one captive screw in the center of the board. Next remove the five brown connector plugs that plug into and around the board. Be sure to mark each connector and which direction the plug inserts since it goes on either way. Once everything is disconnect gently start lifting the board out starting along the back edge. As you pull up the board, remember you are pulling out two rows of connectors and it may be a bit tight. Once the Digital Display board is removed the bulb and socket assembly clamp to a small horizontal bracket just above the VFO dials. Refer to the top picture above showing this location. The socket assembly pulls out sideways to the left, facing the radio from the rear. When pulling out this assembly sideways be careful not to hit or move the VFO dial calibration lever directly behind the bracket. Moving that lever could cause the VFO dials to move out of calibration. After replacing the bulb the assembly is repositioned by reversing the process. I recommend replacing the bulb with a direct replacement only. The heat from this bulb has been know to attribute to VFO drift. Replacing the bulb with the high efficiency bulbs or high wattage bulbs would only add to any VFO drift problem you may already have. Also these bulbs generate excessive amounts of heat which is difficult to remove because of the close and cramped area. This heat has been know to melt the plastic VFO dial and leave a permanent brown burnt area in the plastic dial. 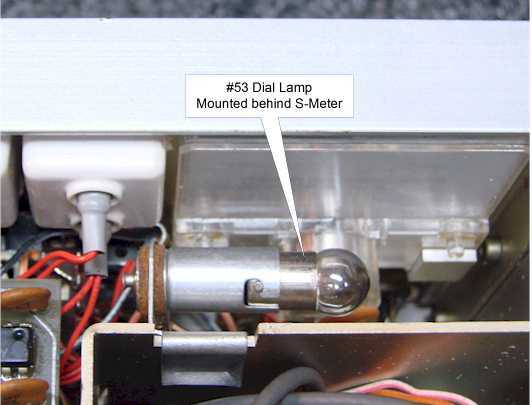 There is now available a high output LED replacement for the #53 bulb. These bulbs are a good replacement if you never want to worry about replacing the bulb again in the future, and eliminate the heat buildup. The solid state replacement bulb has advantages over the older incandescent bulb, but there are also a few drawbacks. The LED replacement bulbs emit a blue color but from inside the radio and the blue VFO dial filter the light turns to a purplish glow. To a Drake purist the purple glow looks weird when you expect to see that nice Drake medium blue glow. On this point its a matter of personal preference which option you choose, but knowing either way has its good and bad points. Over the last few years there have been many articles written on TR-7 transceiver modifications and upgrades. Some of those articles can be found on my "www.wb4hfn.com" website in the "Technical Tips for the User" section. Listed below are four articles written specifically for the TR-7. Click on the title to view the article, listed below the title box is a brief description of the article. If you ever wanted to know exactly what all the differences were between the TR-7 and the TR-7A models, this article should answer most of your questions. This article discusses all the model changes and upgrades, and includes lots of pictures showing the physical chassis and board level changes. This article shows you how to modify the TR-7 Transceiver to allow the front panel "STORE" switch to serve a dual function by adding the ability to key the transmitter in the CW mode. This is a very handy feature for tuning up a linear amplifier and adjusting an antenna tuner for minimum SWR. Upgrade your Drake TR-7 Transceiver to support wide band AM mode transmission. This article shows you how to eliminate using the standard 2.4Khz SSB filter for AM mode transmissions and automatically switch to the 6Khz AM filter. This modification significantly increases the transmit audio quality. Having trouble getting full power output from your Drake TR-7 Transceiver. Here is a interesting troubleshooting article that helps you troubleshoot the amplifier and determine the proper output power with specific input drive level. The article also talks about replacing the final transistors and substitute devices.